At the beginning: two confessions. The first: The name “Bletchley Park” sounds familiar for me since years. I can’t remember why or can’t put my finger on the occasion when the place where hugely intelligent minds cracked the German Enigma code during the Second World War first appeared in my knowledge. And the fact that “Enigma” is connected to Alan Turing was always hidden somewhere in the far regions of my brain – maybe because of some history teacher back at school (a bow to him whoever he was). The second: it needed a Benedict Cumberbatch to get my mind to work and bringing my knowledge back to me. So when it was confirmed that Benedict was about to play Alan Turing in “The Imitation Game” I happily dived into the topic, reading Andrew Hodges’ “The Enigma” and literally getting my hands on any possible information about the codebreaker that helped to shorten the war and saved millions of life. 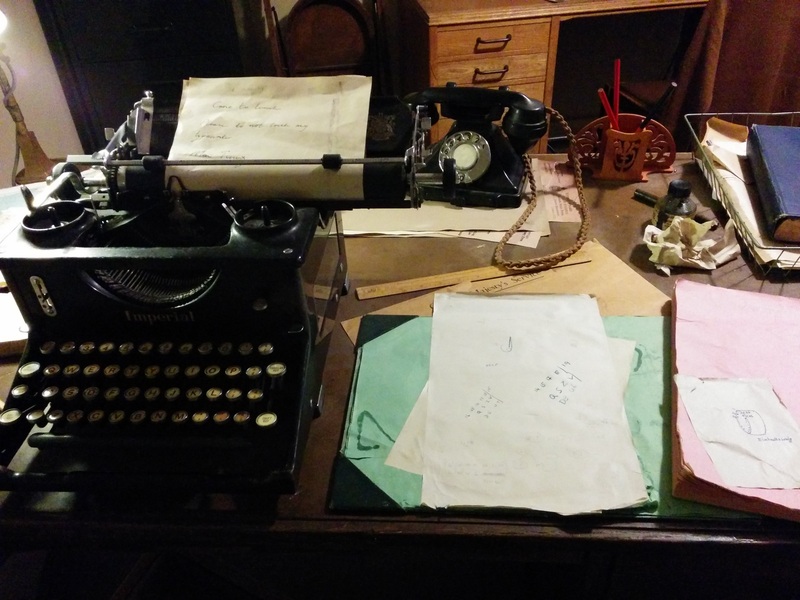 And soon enough I made up my mind to see Bletchley Park for myself, a wish that came true in September of 2015. Only about an hour train drive from London, Bletchley Park is a space packed with a huge pile of information about Enigma (there are lots of different machines on display), both a replica of the original Bombe and the one used in the film “The Imitation Game” (that helped decoding the German messages very fast) and insight looks into life at wartime Bletchley Park with the help of sounds and voices at special spots throughout the place and with offices decorated with very much love to every single detail so that the rooms give the impressions their inhabitants are just off for a lunch break (as the sheet of paper in their typewriters say). Especially in Alan Turing’s office, looking at his desk with papers spreading everywhere, his wardrobe where clothes are stuffed carelessly inside and the radiator with a mug chained to, ready to be used in a moment, the past seems to be so alive that I expected Alan Turing tapping me on the shoulder when I carefully stared at his desk, taking a picture. With the special exhibition “The Imitation Game” about to end on November 1st 2015, some Benedict Cumberbatch fans who are in London for “Hamlet” at the Barbican may think about a visit – they should make up their mind. [Update: The Imitation Game-exhibition will be open at least till July 2016 “due to popular demand”. Great article! That is the kind of info that are supposed to be shared across the net. I very happy to find this internet site on bing, just what I was looking for : D too saved to bookmarks.